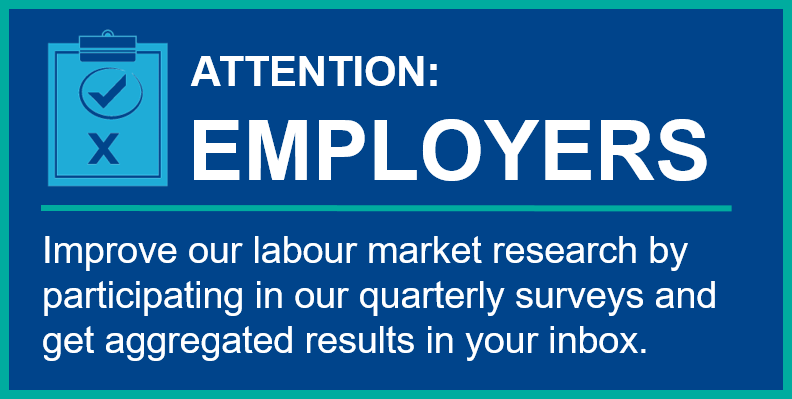 Welcome to the WEdata Sector Blog Series where we review the supply and demand of labour for each of the region’s top sectors of employment. To read more blogs like this, visit www.workforcewindsoressex.com/sectors. The 2,363 organisations in the Health Care and Social Assistance (NAICS #62) sector accounts for 7.1% of businesses in Windsor-Essex. This sector is the 3rd largest employer in our region, with a workforce of approximately 22,790 workers or 12.7% of the total workforce in Windsor-Essex. Organization Size: About half of all organisations are owner-operated with no employees. Of the 1,178 organisations with employees, 70% are small with less than 10 employees. However, this sector also has 15 organisation with large workforces over 200 employees. Demographics: The female to male gender ratio is approximately 5:1 in this sector. Social assistance has the highest gender disparity at 9:1, and Ambulatory Health Care services the least at about 4:2. Females constitute most (58%) of the self-employed workers and all of the unpaid family workers in this sector. While 75% of this workforce is between 25-54 years old, nearly 19% are over 55 years old. Ambulatory Health Care services and Nursing and residential care facilities have the largest proportion of workers over 55, while Social assistance has the largest proportion of workers under 25 years old. Work Activity and Income: The median income for full-year, full-time workers across the sector in Windsor CMA is $52K, which is well over the national median income of $36.5K. However, there are significant income disparities between sub-sectors with Hospital workers earning $76.8K, Ambulatory health care service workers earning $49.5K, and Social Assistance workers earning $39.4K. Hospital workers have the highest incomes in this sector, and even those who work full-year, part-time and part-year, full-time or part-time earn over the national median income of $36.5K. Comparatively, Social Assistance and Ambulatory health care service workers earn half to three-quarters of the national median income when they are not employed in full year, full-time positions. Education and Income: The majority of this sector’s workforce has post-secondary educational qualifications. Over 90% of the Hospital and Ambulatory Health Care service workforce, and more than 75% of the Social Assistance workforce having either apprenticeship, college, university certificate, or university degree qualifications. Higher educational attainment is related to higher incomes in all three major sub-sectors. It is evident that Hospital workers earn the most at all education levels, followed by Ambulatory health care service workers, and lowest paid are Social assistance workers. Retirement: National projected Sector Retirement rates are 4.8% in this sector over the next 7 years. In the Health Care sub-sector, projections are for 900 – 1000 retirements each year in Windsor CMA. Although retirement rates are only slightly lower in Social assistance subsector, the workforce is smaller and it is projected that between 174-191 workers will retire each of the next 7 years. Occupational retirement rates in these sectors are generally slightly lower than the projected national rates of 2%. The exceptions are Management roles in Health care and in Social, community, and correctional services which have projected retirement rates between 3% – 4% until 2026. According to the Canadian Occupational Projections System (COPS) data, the national median retirement age for Health care and Social assistance workers is 63-64, and for General Practitioners and Specialist Physicians is 66 years old. Education and Training: The Enrollment by Institution page shows how many students are enrolled in post-secondary programs at colleges and universities across Ontario. Organisations and businesses can search for the programs and institutions that they recruit and hire graduates from to see recent enrollment numbers for specific programs and institutions. Those organisations that want to attract the best and brightest talent are wise to be proactive and build relationships with education and training institutions and their instructors. Many social assistance and health care employers have developed onsite opportunities for experiential learning placements for students also give employers an opportunity to test-drive potential employees. Everyone benefits. Consultations of local employers in this sector show that education institutions are doing an adequate job of providing training for students for technical skills needed in this sector. However, most employers stress the need for great soft-skills in this sector, as well, such as work ethic, willingness to learn, compassion for patients, and interpersonal skills. Automation: These projections indicate how much of a given occupation’s work activities could be automated. They reflect automation predictions that routine activities, such as predictable physical work and processing and collecting data, are more susceptible to automation, while those at low risk involve managing people and complex tasks employing expertise. The probability of automation for three-quarters of Health care and Social assistance sector professional occupations is less than 40%, but higher for technician, laboratory workers, and home support workers. While automation may lead to some job losses and task restructuring, it is important to keep in mind that the Talented Mr. Robot report and others have concluded that in actuality less than 5% of occupations could be completely automated. The authors suggest that mitigating the potential negative effects will take collaboration between all sectors to increase understanding of the implications, identify local technological strengths and opportunities, and provide education and training to those whose jobs will be impacted. They also acknowledge that automation in sectors is likely to be slower than initial predictions for multiple reasons, including as prohibitive costs, some technological advances are not occurring as quickly as predicted, and people’s preference that humans rather than machines to perform certain tasks. The 2016 Census showed that 24% of the Windsor CMA population is over 60 years old, and that number will increase as our entire population ages. There will be an increased need for healthcare and social assistance workers in all occupations to meet the need for more health and social services as for our aging population. Consultations with local employers in health care and social assistance provide the same evidence that our region’s aging population is creating an increase in demand for health care and social assistance services, leading to growth in this sector. Employers have expressed demand for traditional health care occupations, such as Registered Practical Nurses and/or Registered Nurses. Local employers have also expressed demand for Personal Support Workers (PSWs) in our region due to the aging population. These PSWs should have strong skill sets in communication, interpersonal, and other important soft skills such as compassion for patients. Employers have shared that it is often hard to retain both nurses and PSWs, for separate reasons. There is often a lot of competition, including cross-border competition, for those individuals with nursing skills and experience. As for PSWs, employers are having a hard time with retention due to the shift-type work that is usually offered to PSWs, or the common expectation that PSWs will have to travel to different locations depending on where their clients are located. Sources: Census 2016; The Talented Mr. Robot (2016). For general news and updates via email on our various programs and services, sign up below. We are collecting data to better understand who is looking for work and what kind of opportunities jobseekers are searching for. This data is completely anonymous and non-personally identifiable.